Yesterday, on Day 2 of the $25,000 buy-in PokerStars NL Holdem Players Championship, a hand played out between French player Thi Xoa Nguyen and American Athanasios Polychronopoulos. The cameras were around for it as it was taking place on one of the outer feature tables. Nguyen opened the button when the action had folded to her. Two-time bracelet winner Athanasios Polychronopoulos sat in the big blind and three-bet to what appeared to be 37,000. Nguyen called to see a flop of . Both players decided to check, and the hit the turn. Polychronopoulos checked to Nguyen who bet 17,000. Polychronopoulos called. The completed the board, and Polychronopoulos checked once more. Nguyen bet 50,000 with about 153,000 behind. Polychronopoulos shoved, and Nguyen went deep into the tank thinking things over for some minutes. Eventually, she said "Yeah" before folding face up. Polychronopoulos showed and could only muster a laugh, raking in a pot that could've easily ended Nguyen's tournament life. "Wow!" commentator Lex Veldhuis said when the clip of the hand aired on the live stream. "What?!" exclaimed stream host Joe Stapleton. "What an inspired fold!" host James Hartigan added. "Are you serious?" Stapleton said. "What?!" Veldhuis and Stapleton shouted. Before play got underway on Day 3 of the PSPC, we talked to both players involved in the hand. 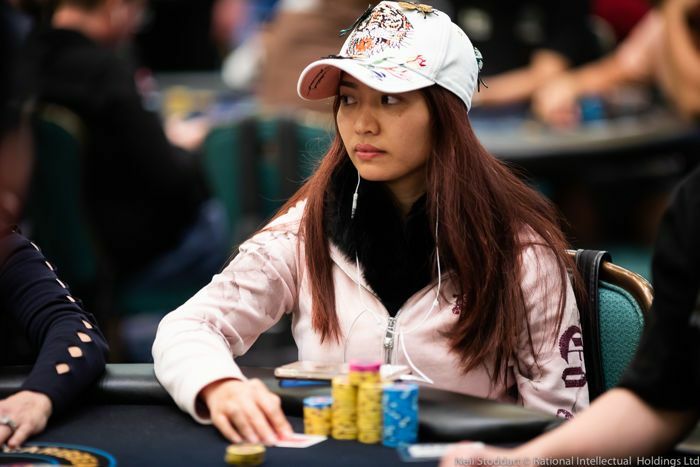 Nguyen said she picked up something before the flop and on the flop that would prove helpful on the river. "The way that I saw before flop how he three-bet me, and on the flop he checked quickly, made me think 'what is he checking on the river?' When he three-bet me before the flop, he looked very certain, he didn't look like he was three-betting me light. That helped me." "When he three-bet me before the flop, he looked very certain, he didn't look like he was three-betting me light. That helped me." With a draw-heavy flop checked by the pre-flop aggressor, Nguyen's spidey sense was tingling. "With the flop like king-queen-nine with a flush draw, I think on the river, which hand is he gonna check?" Most hands, Nguyen discarded from Polychronopoulos' range. "I think he is gonna bet ace-king. Because in a three-bet pot I could have a set or two-pair, so he is gonna check with aces. I think he c-bet with all draws." 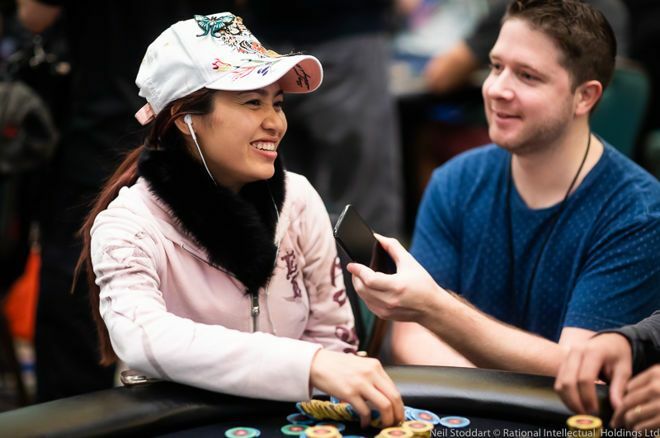 When Polychronopoulos checked the river, Nguyen already thought about the situation and made up her mind: "On the river, in my head, I think I'm gonna bet-fold." Even though she had made up her mind before the check-raise by Polychronopoulos forced her to decide for her tournament life, it naturally wasn't as easy, and it took her a bit of time to actually do it. "I think only the hand he can do that with is kings or aces. Only those hands he checks the flop, all other hands he is gonna c-bet." "It's very difficult because it's still I'm button and he is big blind. Usually, it's a very difficult fold. But I think only the hand he can do that with is kings or aces. Only those hands he checks the flop, all other hands he is gonna c-bet." While Nguyen took several minutes on the river, she wasn't looking for tells, she said. She was thinking over the hand, going over the hands her opponent could take the line with that he had just taken. The tells she had picked up before the flop with Polychronopoulos looking strong, and the tell on the flop with Polychronopoulos checking quickly, helped - but no physical tell on the river played a part in her decision. After thinking it over for some time, Nguyen did fold. "For me too it was difficult, but I trust in my lecture," Nguyen concluded. Polychronopoulos, starting Day 3 of the event two tables over, was all smiles when we approached him. He instantly knew what we were going to ask him, and started to explain his side of things right away. "So, oddly enough, the last two orbits I had shown down two relatively loose hands that I don’t normally play. But I happened to play those bad hands, and they got shown down. I won the pots, but I think I had a loose image," Polychronopoulos started. "I decided to show her she made the correct laydown because she earned it." About the pre-flop action and flop action, Polychronopoulos was pretty clear; he considered no other way to play it. "The queen paired the turn. I thought: that’s probably pretty good for her. I checked, she bet, I called," Polychronopoulos said about the action on the turn. But, as we know, the river was where the real action was. "The river was the ace, bringing the flush. And so I was like well, I want to get all the chips, and I thought maybe the only way to get all the chips was the check-jam. I figured she would over-bet there and so I checked." While Nguyen didn't overbet, she did bet big, and Polychronopoulos followed up with his plan to shove. At this point, the decision had been made; no turning back, so all Polychronopoulos could do was not give away any tells. "I was just trying to focus on my body and posture, and just staring at the same spot on the table. I thought she could very well have a boat or a flush, but I wasn’t really too concerned with it. I knew I had the best hand and I was just waiting for her to call." "She played the hand better than I did, I guess. I hope she does well in this; that would be a great story." She did have a full house, but the call never came. "When she flipped over her hand and folded, I thought, 'Man, she really earned this.'" For Polychronopoulos, it wasn't a question if he should show or not. "I gotta show her, ya know? I mean, poor girl’s gonna be eaten alive forever. Not forever but, it’s gonna hurt her. And the cameras are on; it’s good for the game. I decided to show her she made the correct laydown because she earned it." Some people watching the clip thought that Nguyen called instead of folded when she said 'Yeah' and showed her hand. For Polychronopoulos, though, there was no question Nguyen had made the laydown. "No, she folded, and she put it face-up. I was like, ‘Wow.’ And then I showed her, I said, ‘Here ya go, like congrats, well done, ya know. You earned this.’ Yeah, it was clear that she folded." Polychronopoulos concluded: "It’s fun, it’s why we’re here: playing poker, having fun. She played the hand better than I did, I guess. I hope she does well in this; that would be a great story." Both players are still alive in the $25,000 buy-in PokerStars NL Holdem Players Championship. PokerNews is in the Bahamas to cover the event. Follow all the action via our PCA Live Reporting.